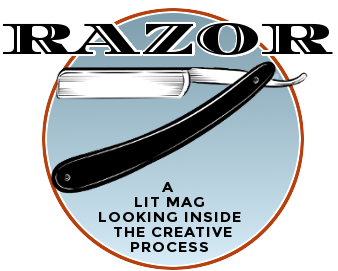 Razor Literary Magazine is a publication of the English department and the Digital Humanities Program at Gustavus Adolphus College, with support from The Mellon Foundation. "Mean ol' world. Mean ol' Writer." Before the Razor of "Mean Girls"
Mean girls, mean boys, mean teachers, mean parents, mean ol’ world. I’ve been teaching a long time and “Mean Girls” took form after some observations of a particular trio of middle school girls who, as 3 singular, harmless 7s, suddenly exploded when they huddled together on the “jackpot” line. "Breathing a bubble out of existence" Before the Razor of "Bubble"
One of our kitchen windows is over the sink and one afternoon as I was scrubbing a pan, a larger-than-usual bubble lingered on my finger— brilliant, colorful in the sun’s rays— and lasted so long, I actually thought about it off and on for the rest of that day. Repeat 44 More Times: How to Write a Presidential Essay Before the Razor of "Warp and Weft (#17)"
Step One: Get your tools. I like these small notebooks from Muji—they’re nice enough to feel important, but not too fancy that I feel bad about writing first drafts in them. "The only channel on TV that got decent reception was PBS" Before the Razor of "On Encroaching Blindness"
This will not begin the way you expect. Begin here, a touch along collarbones. In the winter of 2008 I was deeply depressed. "Trapped between two worlds" Before the Razor of "Pinkie Toe"
“Pinkie Toe” is a short story that came from an exploration of the town in which my novel-in-progress is set. I say fictional but it does bear some similarities with the town I grew up in: Washington, Iowa. "An opportunity for global intimacy" Before the Razor of "there's an app for that ghazal"
I believe both poetry and social media are global platforms for authentic intimacy and connection. This intimacy is vital to the nurturing of empathy and individual self-awareness and growth. "Can you hear me in the void?" Before the Razor of "Youth(Wasted)"
"Youth(Wasted)" is the result of a writing experiment I've been working on for the past few years. Here's how it works: I sit down with pen and paper and place a record on my turntable (in this case M83's "Saturdays=Youth"). "I was five and on the river my mother died" Before the Razor of "Day One as a Volunteer in a Memory Care Center"
When my partner’s father entered a memory care center outside of Portland, Oregon, in 2003, little did we know he would live there for 4 ½ years as dementia slowly destroyed his mind and took his life. Inspired by my ongoing explorations into daily meditation, the images in this series show other inquisitive beings like myself--although not necessarily human--experiencing moments of heightened awareness and wisdom. "It was really important for me to tackle the taboo" Before the Razor of "aria,"
Hear poet deziree a. brown speak about writing "aria,"
"Scavenge your corpse for its knowledge of pain" Before the Razor of "Letting Go"
I blame DaVinci. Well, sort of. In second grade, trying to decide what I wanted to be when I grew up, I quickly discarded the usual fare ­ cowboy astronaut space pirate who is King of Scotland felt like a lot of work ­ and I was drawn to art. "If poetry is therapy, then it’s electroconvulsive shock therapy." Before the Razor of "Sunday School"
"Sunday School” was a poem occasioned by the memory of a unique smell. In this case, the smell of my mother’s saliva as she spit-cleaned me in the car before church. "I don't think I'll ever write a happy ending." Before the Razor of "At the Beach"
This piece was actually created from a writing exercise for a class in graduate school, where we had to write a story based off of a postcard we were given. I know it’s sanctimonious to publish something from a writing exercise, but this piece is one of my favorites I’ve composed. "A reading experience that was as conversational as sitting at the end of the bar." Before the Razor of "Brazil, Indiana (a folk poem)"
“Not in ideas, but in things,” physician/poet William Carlos Williams famously suggested, becoming the spokesman (whether he wanted to be or not) for what became known as the Objectivist school of poetry.